The other day, I was contacted by Michelle of Bleeding Espresso about the O foods contest for Ovarian Cancer Awareness Month. The goal is to spread awareness by posting a recipe with a food that starts or ends with the letter O. I thought this sounded like a great idea for a great cause and started pondering what I could possibly submit. At the same time, I was perusing the Williams Sonoma Fish book and noticed an incredibly simple dish of pan-roasted salmon fillets in mango juice. 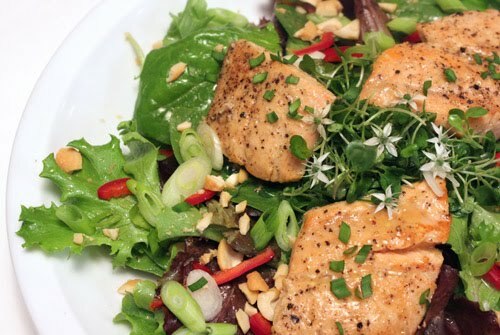 I imagined that mango salmon could be placed on a crisp, fresh salad, and I realized that mango ends in O.
I wasn’t kidding about how simple this is, and there really isn’t much to the recipe. You simply place some salmon fillets in a glass dish and pour mango juice over them. Let the salmon sit in the mango juice for 20 minutes while you pre-heat the oven to 450 degrees F. Then, heat a tablespoon of olive oil in a non-stick skillet over medium-high heat, remove the salmon from the mango bath and dry each piece, and place the salmon flesh-side down in the skillet. Turn the heat down to medium and sear the salmon for five minutes. Carefully turn the fillets and place the skillet in the hot oven for about three minutes. Pour the mango juice from the glass dish into a saucepan and bring to a boil. Let the juice simmer for a few minutes to thicken slightly. Remove the skillet from the oven and pour the simmered juice over the salmon. Chopped garlic chives garnished the salmon, and since my garlic chive plants have flowers right now, I garnished with those as well. For the salad, I made a lime shallot vinaigrette which was tossed with mixed baby lettuces. That formed a bed on each plate. While grocery shopping, I looked for something to sit in the center of the salad and found some delicate, little arugula micro greens that were locally grown at Bella Verdi Farms. Those were also tossed with some of the vinaigrette and were then placed in the center of the salad. Pieces of mango sauce-covered salmon were placed around the mound of micro greens. For contrast, flavor, and crunch, I sprinkled on thinly sliced red fresno chiles and green onions and some chopped cashews. September is Ovarian Cancer Awareness Month, and for the second year in a row, Sara of Ms Adventures in Italy and Michelle of Bleeding Espresso are hosting the O Foods Contest to raise awareness of this important health issue. ONE: Post a recipe to your blog using a food that starts or ends with the letter O (e.g., oatmeal, orange, okra, octopus, olive, onion, potato, tomato); include this entire text box in the post; and send your post url along with a photo (100 x 100) to ofoods[at]gmail[dot]com by 11:59 pm (Italy time) on Monday, September 28, 2009. TWO: If you’re not into the recipe thing, simply post this entire text box in a post on your blog to help spread the word and send your post url to ofoods[at]gmail[dot]com by 11:59 pm (Italy time) on Monday, September 28, 2009. One winner chosen at random will receive a Teal Toes tote bag filled with ovarian cancer awareness goodies that you can spread around amongst your friends and family. Ovarian cancer is the leading cause of death from gynecologic cancers in the United States and is the fifth leading cause of cancer death among U.S. women; a woman’s lifetime risk of ovarian cancer is 1 in 67. The symptoms of ovarian cancer are often vague and subtle, making it difficult to diagnose, but include bloating, pelvic and/or abdominal pain, difficulty eating or feeling full quickly; and urinary symptoms (urgency or frequency). There is no effective screening test for ovarian cancer but there are tests which can detect ovarian cancer when patients are at high risk or have early symptoms. In spite of this, patients are usually diagnosed in advanced stages and only 45% survive longer than five years. Only 19% of cases are caught before the cancer has spread beyond the ovary to the pelvic region. When ovarian cancer is detected and treated early on, the five-year survival rate is greater than 92%. And remember, you can also always donate to the Ovarian Cancer Research Fund at our page through FirstGiving! Please help spread the word about ovarian cancer. Together we can make enough noise to kill this silent killer. Beautiful salad, Lisa. Too bad I didn't hear about the contest until today. :( Hope you win! What a great activity. Such gorgeous greens, and that salmon looks perfect. Good Luck - hope you WIN! Lovely salad Lisa! Not just healthy but delicious as well. This salad looks really lovely salad! Definitely a healthy dish. Beautiful dish for a wonderful cause! Love the greens! What a great cause. Love your dish. I love how you did this for a good cause. And I love how easy this dish is. Do you think you could use other juices besides mango? I'm thinking the technique would be versatile enough to use with maybe pomegranate juice or even carrot juice. Lovely salad. Funny, I had salad and salmon last night too, but in all truthfulness, yours looks way better. Fab of you to give your attention to such a good cause. What a lovely meal & for a good cause too!! 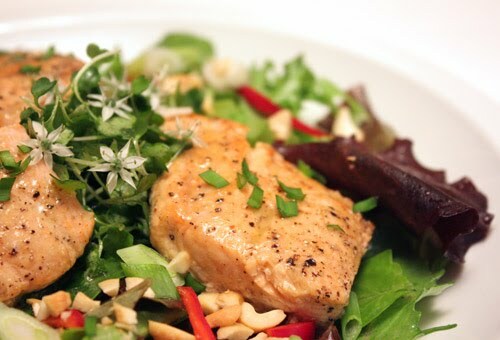 A delicious salmon & salad dish!!! Love your dish and salad for such a good cause. That salad looks so good! I'm a big fan of salmon! Carolyn: Great idea to try this with other juices. I think carrot juice would be delicious. I wonder if pomegranate might need to be mixed with another sweeter juice because the natural sugars become like a glaze. Marinade with mango juice sounds wonderful for the salmon, must result in excellent flavors! Well that is the first time that I hear about this contest..lol... but I do love your salad and marinating the salmon in the mango must be delicious! eek--i love the little flowers! they add even more beauty to an already-gorgeous creation. great submission to a worthy cause, lisa! I knew there was a contest about it, but didn't know the details of participation, thanks for the detailed information. I hope I can come up with something to contribute to the event. You know that I love salmon, yours with mango sounds and looks terrific. p.s. I notice that you have added a dish at the right corner of your header. ;-)Was that atop also a salmon steak? It may be simple to make but there's nothing simple about the flavors. Looks really delicious!! Looks great on the plate, that's for sure. A special dish for a special cause. My cousin who is only 26 was diagnosed with ovarian cancer early this year. Luckily it was stage 1 and she has recovered after an emergency surgery. Anyway, this is a really delicious and healthy meal which I would love to try. I really believe that we are what we eat, esp our health. Great recipe - love how easy it is. And your pictures are excellent too. you know i have cooked with mango juice. what a neat idea. I have used other juices, but the mind kind a get stuck when i am used to having mango juice just my itself.. I missed the Ovarian cancer event.. don't know how:-(.. made the pesto & then did not do it in time.